Keep markers, pencils, and crayons available at home. Children develop skills that prepare them for writing through their normal play — like drawing, painting, and tracing objects. This kind of play helps prepare the brain and the muscles for holding a pencil and forming written words. Help them learn to write their name. This is an empowering experience, and allows them to begin to identify themselves as writers. Involve them in your writing activities. Make a shopping list together and point out the words that start with the same letter as the child's name. Read books with kids. Early and frequent exposure to letters, sounds, words, and stories helps kids learn to read and write. Once children start learning letters, you can practice writing them on paper, in the air, or in sand or snow. These tactile experiences help them feel the shape and motion of the letter. 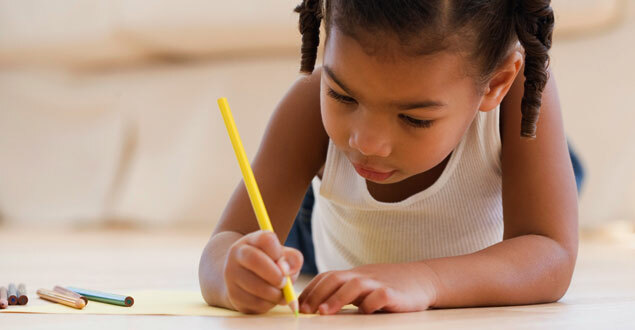 As your child begins to write letters, caption what they've written. Ask your child, "What does this say?" Write their words under their writing. This helps them learn more about letters and words. As you read to your children, point out things the book author did to make the book so fun to read. "Wow! Listen to how the author describes the ocean. Don't those words make you feel like you're back jumping over waves?" Show your children that you write too. Let your children see you writing thank you notes, composing an e-mail, or communicating with your child's school.